Hotel group Jurys Inn has unveiled the Suvet – a cosy hybrid of a suit and duvet that aims to make losing an hour of sleep on Sunday more bearable. Costume designer Wendy Benstead was enlisted to turn the bonkers idea into reality. 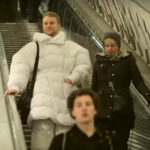 The design, which was apparently inspired by the latest trend of quilted clothing, comprises the hotel chain’s feather and down duvet, ‘comfy-chic’ detailing, a snood-like collar that doubles as a pillow, and giant shoulder pads to claim space on public transport. The Suvet comes in both male and female variations, although the difference between the two is not clear. Working with agency Citizen Relations, Jurys Inn devised the suit to create the snuggly feeling of being in bed in public, ahead of Brits losing an hour of sleep when the clocks go forward for British Summer Time this weekend. Jurys Inn developed the garment following research that 43 per cent of British residents nap on public transport, while 22 per cent have owned up to snoozing at work.